Time is running out for individuals and families to sign up for health insurance for 2016. The open enrollment period for the Healthcare Marketplace ends on January 31, and anyone not covered by an employer plan, Medicare or Medicaid, or a plan purchased off the Marketplace will be subject to a fee from the federal government. 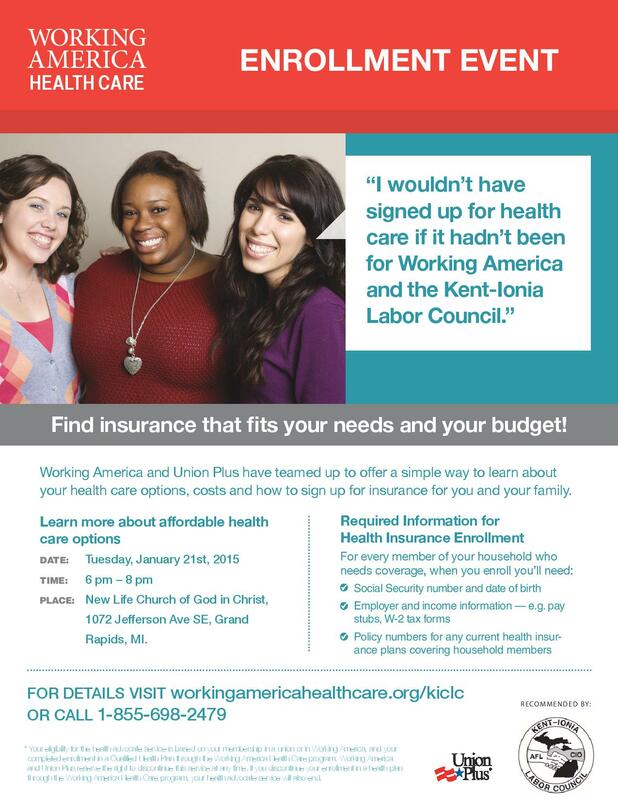 If you're still without a health plan, or have questions about the Marketplace, and need some face-to-face help finding a plan that fits your needs and budget, the Kent-Ionia Labor Council is holding a Healthcare Enrollment Event on Thursday, January 21, at New Life Church of God in Christ, 1072 Jefferson Ave SE in Grand Rapids. The event is free, and representatives will be on-hand to answer questions and walk people through the enrollment process. There will also be a Medicaid representative available to enroll people who are eligible for Medicaid. If you just have questions, please stop by and we'll get them answered. If you're ready to enroll, please come to the event with the following items for everyone in your household who needs coverage: Social Security Number and date of birth, employer and income information (W-2s or pay stubs), policy numbers for any plans current health insurance plans. WHAT: Healthcare Enrollment Event-- shop for insurance plans, get your questions answered! MORE INFO: Email Steve at [email protected] or call 616-456-8233. Click here for flyer.